Today's project is another clean and simple card for this week's challenge: create a square card. I pulled out my sadly neglected Kind Thoughts Brocade stencil to make the stippled background on this card. 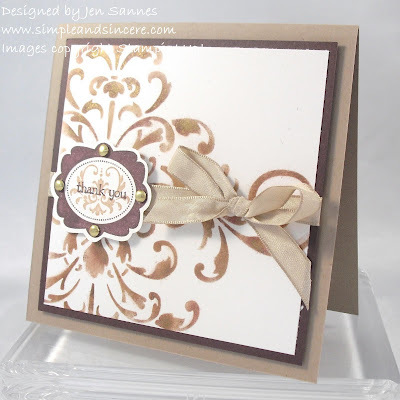 To create the stencilled image, I used Creamy Caramel, Close to Cocoa, and Chocolate Chip inks. I also highlighted several areas with my Encore Gold Pigment Ink. I finished the card off with some Kraft taffeta ribbon and the framed sentiment, using my For All You Do and Framed With Love sets. I like the elegant, vintage feel of the finished card. That's all for today - have a great day! I love this! wouldn't have thought to use the stencil this way, but it's wonderful!